Back on Monday I wrote about the broken Body of Christ – reflecting on ways to account for the divisions within the Church today. At the end of the post I mentioned how the guidance of the Holy Spirit is only a third of the story, or maybe only a quarter, and left a teaser for further discussion. That discussion is this post. On Tuesday I posted some reflections on a recent article calling out certain issues with the Three Streams model. I mainly contrasted the uncritical adherence to that model to the way I had begun to apprehend the Three Streams, but even at the end of that post I admitted there was still something amiss. I’ll start with a very brief recollection of the characteristics of the Three Streams as I understand them. If you want details on these, click here. Evangelical – unite under the Bible; authority from a confessional document; Jesus the preacher; celebrate the resurrection on Easter; risk of partisanship. Charismatic – unite in the Spirit; authority from the unction of the Holy Spirit; Jesus the prophet; celebrate the empowerment on Pentecost; risk of subjectivity. Catholic – unite in Truth, ; authority from Apostolic Succession; Jesus the high priest; celebrate the incarnation on Christmas; risk of dead tradition. Now, if you also bring in the way each of these three streams prefer to read Scripture, you’ll start to see what I’ve been noticing recently. There’s a famous epistemological model called the Wesleyan Quadrilateral. (Epistemology is the study of how we know things.) Perhaps an illustration is in order. 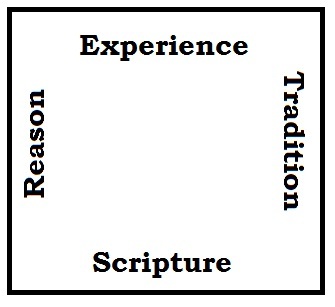 As Christians, the base of our epistemology is Scripture (hence it’s on the bottom of the square). The Bible is perfectly authoritative in its revelation of God and cannot be contradicted. Ever. Contrasting with Scripture is our experience of the Holy Spirit; where Scripture can seem remote and impersonal, experience is immediate and personal, so they can be the hardest to reconcile (thus they’re on opposite sides of the square). Then, on the left is reason. We don’t just take the words off the page of the Bible and match them blindly to our experiences; we also engage our brains to make sense of things. This is where most (though not all!) of the work of academic theology goes on. Balancing out reason, however, is tradition. In a way, tradition is the reason of people in the past, enshrined in practices that abide throughout the history of the Church. So that’s the Wesleyan Quadrilateral, and different denominations play out their favorites among those four sides in various ways. The Three Streams each bring a special focus to each of the sides. The Evangelical stream champions the Scripture side. The Charismatic stream champions the Experience side. The Catholic stream champions the Tradition side. Obviously, all three streams make use of reason. In fact, as I’ve argued before, all three streams make use of one another, too. So why is Reason left out? Is there a fourth stream that we’re missing? I spent some time thinking about this last week, and I suspect that there may indeed be a place for a fourth stream in this model. I don’t know what to call it, so I’ll do my best to describe what’s “missing” from the three stream model as it stands thus far. Where the Evangelicals specialize in Scripture, the Charismatics specialize in the Experience of the Holy Spirit, and the Catholics specialize in Tradition, this fourth stream specializes in the role of Reason. Where Evangelical authority is confessional, Charismatic authority is by the Spirit’s unction, and Catholic authority is by succession, fourth stream authority might be in systematic theological discourse. Where Evangelicals focus on Jesus the preacher, Charismatics on Jesus the prophet, and Catholics on Jesus the priest, the fourth stream might focus on Jesus the teacher. The ultimate holiday for Evangelicals is Easter (for its gospel events), for Charismatics Pentecost (for its Holy Spirit work), and Catholics Christmas (for the Word made flesh), the fourth stream’s favorite holiday may well be Trinity Sunday (for its theological triumph). The main risks each stream runs are partisanship, subjectivism, and dead tradition. The fourth stream’s major risk would probably be liberalism. Besides the appeal to the missing side of the Wesleyan Quadrilateral, there is one other major factor that has led me to this theorized fourth stream: the fact that there is precedent for this in the Anglican tradition. Early on there were two major parties in the Church in England: the traditionalists who wanted to keep everything Catholic, and the reformers who wanted to make the English Church Protestant. By the time of the Elizabethan Settlement, these had settled down into Low Church (Evangelical) and High Church (Anglo-Catholic). Although they disagreed on certain things, they were able to share a common claim to the Anglican heritage of worship. From these two parties, two more eventually emerged. One was the holiness movement, championed by the likes of John Wesley. This movement mostly ended up departing from official Anglicanism in the 1700’s and returning in the form of the Charismatic Renewal in the late 1900’s. Hence the Charismatic stream. The other party that emerged from the early Anglican tradition was the Broad Church. It was neither High nor Low, for it was not particularly caught up in the types of arguments that the Evangelicals and Anglo-Catholics were carrying out. For the most part, the Broad Church tradition was very rationalist and gave birth to the liberalism that we see killing the Church in virtually every denomination. Yeah, not a pretty heritage for the fourth stream, if you can call it that. But its Christian origin – bringing human reason into the mix of interpreting Scripture, receiving Tradition, and listening to the Spirit – is perfectly legitimate. If you’re not convinced that this fourth stream is real, or worth talking about, no sweat. I’m not convinced either. But it’s an interesting theory to explore. After all, the Three Streams thing is still very new; it’s definitely subject to examination, change, replacement, or the rubbish bin. Time will tell. This entry was posted in Theological and tagged authority, ecclesiology, history, theology. Bookmark the permalink. P.S. I apologize for throwing around “liberalism” like a bad word. Most of the Christian circles in which I walk use “liberalism” to refer to people who are so theologically liberal that they are no longer Christians. I realize that in there is such thing as “the Christian Left” politically speaking, and that “liberalism” in its original proper context can still be rightly considered Christian. Please forgive my oversimplification here.